Clay Pebbles are made from 100% natural clay, they are clean, pH stable, and offer both great aeration and drainage. Due to their unique structure and large surface area they offer the ideal environment to foster beneficial bacterial growth around the root zone leading to healthier plants naturally. Clay Pebbles will not float once fully wet, and are pre-cleaned. VitaLink® Clay Pebbles are 8-20mm clay pellets that have a lower bulk density meaning they are lighter, leading to higher porosity and therefore, more water retention. 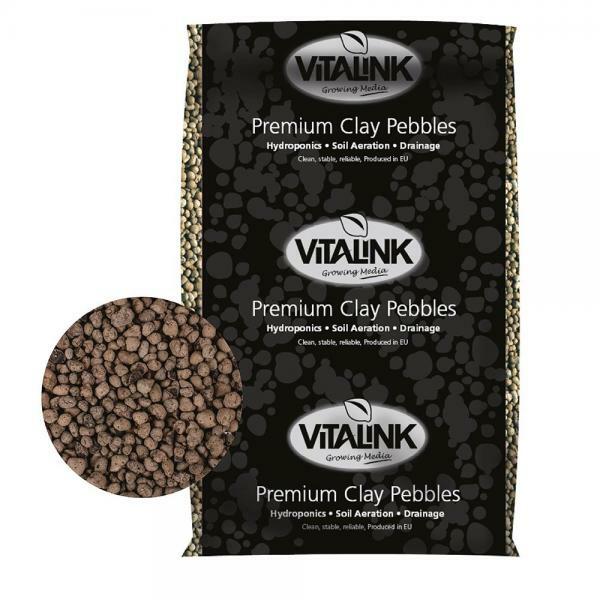 VitaLink® Clay Pebbles offer the following benefits over competitor products: • VitaLink® Clay Pebbles offer a tumbled surface without sharp edges that can cut delicate roots and harm plants making them vulnerable to pests and diseases • Ensures good root aeration (non-compaction) • Extremely stable in both pH and EC and helps prevent excess acidity build up • Performs excellently in Flood and Drain systems where oxygen exchange in thick root mass is essential • Strong structural integrity means that they are less likely to breakand compact, which can lead to blocked dripper systems • Pre-washed to aid in stability • The pebbles drain freely and do not hold any excessive water, which is why they provide good oxygen levels around the root and why they are particularly suitable for Flood and Drain systems. They are also used extensively for Multi Pot systems and drip fed WaterFarm type systems.